Sitting on a couch and ordering the voice assistant provided with your gadget to do as per your needs, is nothing but a blissful experience and super excitingly Apple, Google and Samsung have come up with their own digital voice assistants to let you experience the best with Bixby/ Siri/ Google Assistant. Siri has met this demand well, and has already created a stir in the market, where users admire interacting with Siri and this has led to the business of iPhone market bloom; in this run there are more digital assistants as well which are trying their level best to meet the users’ demand with the dose of high-end technology integrated into it. Eventually talking to your phone than typing on your phone holds a major difference, but the biggest question comes for a commoner, that which digital assistant to pick and which not, since there are many options with their preferred characteristics, and being a naïve in the field of digital assistant, there are many chances that you might pick something which does not suit your requirements. Then in order to beat this issue, I would suggest you sit and draw a comparison amongst all and get your answer. Where are you going ??????? You cannot deny the fact that no matter how good the technology, but if you cannot access it with an ease, then it is of no use for you. Google Assistant is present on iPhones, Siri can be accessed on iPhones. As we know that Google Assistant and Siri have a voice command option with a long-press on home button shortcut, but Bixby scores more here by including a dedicated hardware button and also the button is placed just below the volume buttons, making it easier to be accessed. We all need to take the screenshots, as and when required and the screenshot action is well performed by Bixby and Google Assistant. Though Google Assistant has better command since it allows you to edit and share the screenshot directly, whereas Bixby took me to the gallery, where my one more step to perform a required action is increased. And on the other hand, Siri didn’t fit the requirement. On the other hand, the response time from Siri can be placed on the second number and Bixby picks the response time slowly. As we all know that, voice assistants, usually take more time to obey a complex command, or don’t understand at all. But when we have to compare the list of assistants on the basis of different features, then I need to judge on different aspects. For instance: Bixby takes care of the complex requests efficiently and handles the long requests perfectly. And Google Assistant opens the app simply and has restricted understanding. On the Siri, the iOS 11 has brought third-party app support. There are many situations when you may have to uninstall or install the mobile app, so when you ask the assistants to perform this task, Bixby beats the competition bug, since not just take you to store but start installing the app, whereas the Google Assistant give you the link to download the app and Siri takes you to the app store. Even for uninstalling the app Bixby comes out as a winner, by simply following the instructions followed by a permission message, whereas Google Assistant merely showed the help web page, and Siri does not uninstall the default apps. All three assistants are capable of handling the requests via text inputs, but the Bixby has taken this to a different level by sharing the image inputs as well from the camera or from the existing pictures or from the web browser. Bixby also offers the contextual information, like business listings, information on a landmark, which is something similar to the Google Now on Tap feature. 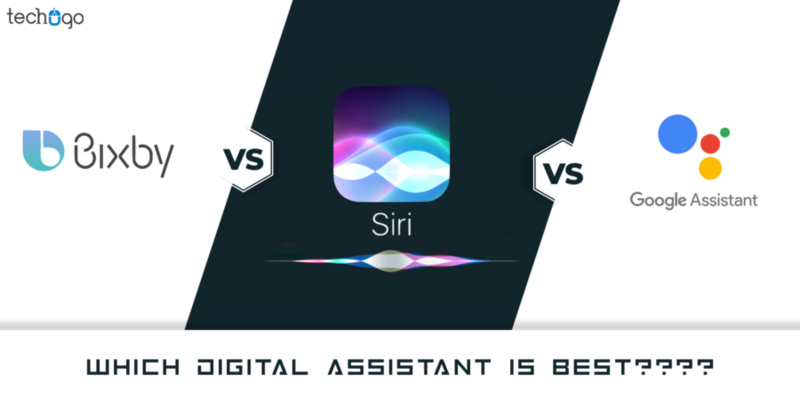 Messaging feature is nothing uncommon with either of the assistants, these all three are capable to handle this, but indeed Siri has won the race here as well, which is fastest being compared to Bixby. For instance, when you command to “Read my latest message” Bixby and Siri, obey and read, but Google Assistant first asks shows your message and then ask if you want it to be read. Which assistant is the best??? Well, no doubt each of the assistants has its own set of qualities and the characteristics, but yet if I have to pick one and suggest further, then it would be Bixby, due to different reasons. To swipe the screen left, right; Scroll up and down, Clear notifications, and close all open apps. To edit photographs, click photos, create albums, name albums, view the last captured photos, post the photos on a social network with a caption. To turn on Silent Mode, change the phone theme, device Maintenance, Battery Power Saving Modes, Changing the Screen Mode, Turning Blue Light filter on and off and other operations in Settings. You can have the Third Party Integration in the best mode with Bixby. Custom chat and Custom Commands. A separate feature for asking questions, so the Commands don’t get confused with Questions you have. Well, this is my personal choice and opinion and is not based on any technical input from any company or organization, so it depends on you which assistant you pick depending on your needs. The reason I find it necessary to mention, since my job as a COO of an app development company, might raise the question of favoring a particular assistant, but trust me this is my personal and unbiased opinion as a commoner and a user, who wants to keep the other users updated about the better option available in the market. With this note, I sign-off for today and I really hope you would be delighted and will gain benefits from my thoughts shared in this blog piece.